After a short retirement, Hunter S. Thompson decided to unleash his brand of Gonzo journalism on the world. The year in 1980. Ronald Reagan has just been elected. It’s time the man who brought us Fear and Loathing in Las Vegas returned. So, did Rolling Stone send Thompson to do a hard-hitting piece on the conservative firebrand headed for the White House? Actually, he was commissioned by Running, an obscure magazine out of Eugene, Oregon, to cover the 1980 Honolulu Marathon. One can’t exactly be sure what the editors were thinking. Thompson’s assignments usually resulted in his becoming the story itself. Naturally, Thompson entered himself and illustrator Ralph Steadman in the race with an eye on pulling a Rosie Ruiz. (Ruiz famously cheated in the Boston Marathon in the late 70s.) Cover the race Thompson does, finding the running culture as alien as anything he might have seen riding with the Hell’s Angels in the late 60s. ﻿ Of course, this being Thompson, he befriends a guy on the plane to Hawaii who had his hand stuck in the airline toilet, leaving it permanently stained blue. There are only a handful of reasons why someone sticks their arm in the toilet, and they are all reasons for Thompson to hang out with this person. Thompson, of course, discovers the real story, marlin fishing off the Big Island. He has a contempt for Hawaii he tries to justify with excerpts from Mark Twain and from a first-hand account of Captain Cook’s ill-fated visit to the islands. There are drug dealers, real estate kingpins, and the legend of Lono, a crazy Hawaiian god promised to return one day. 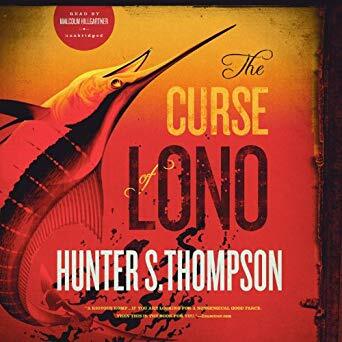 Thompson declares himself Lono after landing a giant marlin. It does not go over well, and Thompson… Well, I’ll let him tell it. It’s Gonzo gone middle-aged. Not fear and loathing in Hilo. Maybe fear and ennui.